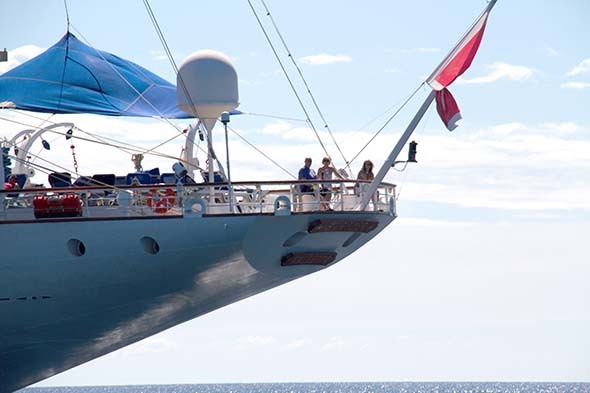 the sails into place as the four-masted Star Flyer left port. As one of the tallest tall ships around, anchored at the glitzy movie port of Cannes, the spectacle seemed entirely appropriate. In a spray of sparkling seawater, our four-day voyage along the French Riviera began, carried by a ship that echoed the 19th century golden age of sail. The masts of Star Flyer stand a proud 226ft tall. It was the first ship of its kind built since before the First World War, and has a twin sister, the Star Clipper, and a younger sister, the Royal Clipper, which holds the Guinness World Record for being the biggest five-masted ship in the world. Plus there’s a fourth vessel in the works, as Star Clippers aims to build the world’s biggest square-rigger. These same magnificent ships also plough through the ice of the Baltic and glide through the warmth of the tropical Indian Ocean. of Star Flyer, which has a degree of informality not found in larger cruise ships. Or so I’m told. The truth is that this 170-passenger cruise ship is the largest I’ve stepped foot on (unless you count Channel ferries and yachts). It’s left me with a certain apprehension for these giant stalwarts of the sea. I needn’t have worried. The claustrophobic queues I’d imagined just didn’t materialise: it’s easy enough to hop on and hop off the frequent services that whisked us about in Corsica, St Tropez and Monaco. And there’s certainly no hint of washing up lonely in this seasoned crowd. Krafft explained how everyone knows everyone else after three days at sea, while more than one of the passengers I met cited a Star Clippers ship as the place they found their partner. Perhaps that’s why more than 60 per cent of passengers are repeat customers, at home with the vessel and familiar to the crew. No, the only cause for concern, if it could be called that, was the revelation of my nautical ignorance: I just didn’t know enough of the technical terms. I could fumble my way through the bridge, the galley, the deck and the crow’s nest but by the time we’d reached the bilge, mainsheets, tenders and baggywrinkles, I was flustered in the muster station. Over dinner on the first night it transpired that I didn’t even know the difference between a ship and a boat (compounding my social disgrace by comparing kayaks to canoes). of the Rhine was slow to appreciate nautical technology, I’d allow myself the odd lapse in vocabulary. Corsica, the childhood home of this fearsome man, offers respite from revolution today. Hiking trails cross craggy peaks and a sandy stretch of beach lives footsteps away from the quiet port of Calvi. My feet led me along a steep and cobbled road to the citadel and up, up, up through a series of hairpin turns. 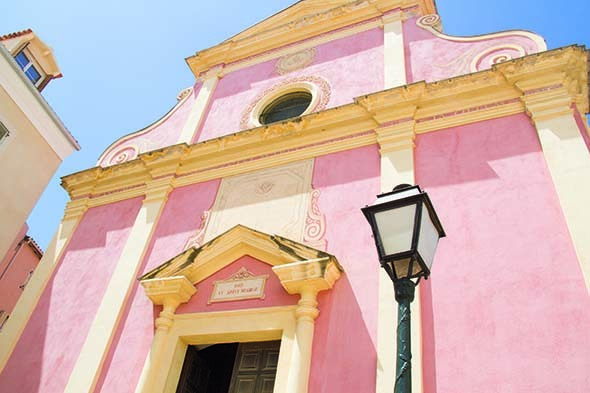 Burgundy begonias clustered around tables and voices echoed inside the pink-walled churches. Bright boats swayed on the turquoise water below and in the distance, Star Flyer waited, sails down, masts upright, ropes a spidery network of yesteryear’s sailing. Somewhat distracted and exhilarated by my surroundings, I returned to the lower town to confront what was to become a recurring dilemma: where to have lunch? back on Star Flyer a permanent feast awaits. The single restaurant serves fresh buffet breakfasts and lunches that – importantly in this modern world – cater for all sorts of allergies, intolerances and personal beliefs. Afternoons brought sushi and creole-inspired snacks, while tea and coffee were available all day long. Dinners were more formal, yet the dress code, like everything else, felt relaxed: long trousers for men, no flip flops, and no swimsuits. Alas, the weather “unfriended” us as we pulled into Monaco, the usually shimmering skyscrapers subdued against the clouds. But everything else in the principality was abuzz. It was the peak of Grand Prix season and from the shore to the Monte Carlo Casino, the buzz of speeding cars filled the air like angry wasps. Formula One aficionados delighted in retracing the route, while I turned my ears to some live music in a bar. After Monaco we headed west but swell thwarted us from reaching the beach at St Tropez, leaving me to take refuge in my favourite part of the ship: the library. Snuggled up on scarlet velvet, I browsed through books and lingered over the brushstrokes of the antique clipper paintings. The cabins also doubled as boutique retreats as the wild winds blew. Each room had a private TV and DVD player, with white cotton sheets tucked beneath a gold metallic bedspread with royal blue trim. But bad luck can only last so long and by the time we reached the final afternoon of our cruise, the swell had calmed and the sky returned to the kind of azure blue that befits the French Riviera. a seductive place, blending mosaic- studded fish markets with 1950s glamour, and impressionist art from Matisse and his mates, showcased in a former chapel; the perfect final port of call for our voyage. As we prepared to say goodbye to the French Riviera, Star Flyer filled its sails to grace the waves for the final trip back to Cannes; music thundering from the ship’s loudspeakers, ropes spinning and sails billowing – all thanks to the persistence of one man and his childhood dream. GETTING THERE: A three-night cruise on board Star Flyer costs from £799pp, including return flights from London, transfers and all meals on board. 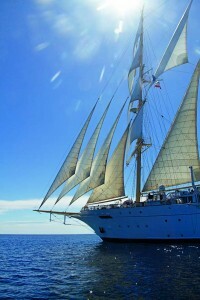 Visit starclippers.co.uk or call 0808 231 4798.